Congratulations to the 2016 Top Women in PR! 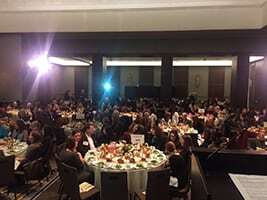 PR News celebrated its Top Women in PR honorees at an awards luncheon held at New York City's Grand Hyatt on Jan. 26, 2016. Communications leaders from brands and agencies were honored for their work over the past year in making bold advances in managing crises, developing brand messages, protecting and building reputations and creating content for digital platforms. PR News' 2016 Top Women in PR were honored at a Jan. 26 luncheon event in New York. Judy Robinett, author of "How to Be a Power Connector: the 5+50+150 Rule," gave the keynote address. Robinett is a startup funding advisor and angel investor, and shared her thoughts on creating a personal power grid of influence to spark professional and personal success. Below is the full list of PR News' 2016 Top Women in PR honorees. Trisha Cardos, Showtime Networks Inc.
Robin McMillan, Showtime Networks Inc.
Rosemary Mercedes, Univision Communications Inc.
Suzanne Parsonage Miller, SPM Communications, Inc.